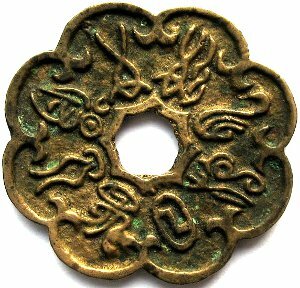 Despite having invented the excellent phonetic writing system known as Hangul (한글) in 1443, Korea continued to use Chinese inscriptions on its coins until the early 20th Century. These inscriptions were written in a calligraphic style known as “regular script” (楷書). Old Korean charms also had their inscriptions written in the same style of Chinese characters. The Korean charm displayed at the left is therefore unusual for a couple of reasons. First, the Chinese characters appear to be written in a very ancient form of seal script known as “bird-worm seal script” (鸟虫篆). And second, the apparent purpose of the charm is not to promote good luck or provide protection but rather to teach Chinese characters. Imagine, for example, a father wanting to teach Chinese characters to his young son. This charm does this as follows. The first four characters (水得女汝) gives a simple way to remember the character meaning “you” (汝). The charm explains that the Chinese character for “you” (汝) is composed of water (氵) on its left and “woman” (女) on its right. Similarly, the last four characters (月於日明) explain how to recognize the Chinese character meaning “bright” (明). The word “bright” (明) has the “sun” (日) on its left and the “moon” (月) on its right. But there may be more here than meets the eye. I have not been able to find any Chinese or Japanese source that agrees with this reading of the inscription. Chinese familiar with ancient styles of Chinese calligraphy state that this is a “mutilated” seal script with many “modernized” characters. Choosing a “faux” seal script may have been intentional, however, since the inscription may have a hidden meaning. In any case, there does seem to be a consensus among both Chinese and Japanese concerning what is written on the charm. They believe the character 月 (moon) is actually the character 勿 (do not) and that the character 明 (bright) is the character 易 (easy). 勿 + 日 = 易. The British Museum also agrees with this reading of the inscription. Chinese characters can have different meanings depending on the context. For example, the character 日 not only means “sun” but is also recognized as an abbreviation for Japan (日本). The character 易 not only means “easy” but can also mean “exchange” as in to exchange goods (trade or barter). This inscription could therefore be interpreted to mean “do not do business with Japan” (勿於日易). This would have been a very common sentiment among Koreans given the suffering they endured under Japanese rule during the 20th Century. Under the guise of explaining a Chinese character written in a difficult to understand calligraphic style, a popular political expression could be cleverly hidden while still in plain view. Interestingly enough, this charm apparently did not exist prior to the Japanese occupation of Korea. The earliest record of its existence seems to date from the 1920’s in a rubbing from a Korean collector known as “Li De Zhuang” (丽德庄). The reverse side of the charm, shown at the left, teaches two other Chinese characters. The last four characters describe the character “red” (红). Is there is a concealed meaning here as well? This it the only charm that I know of that purports to teach Chinese. In both China and Korea, the traditional method to teach Chinese characters to children was with the “Thousand Character Classic” (千字文). This ancient primer is a poem composed of 250 phrases with each phrase consisting of 4 Chinese characters. What is remarkable is that each Chinese character is used only once! Therefore, a young student will have learned 1,000 Chinese characters after mastering the book. 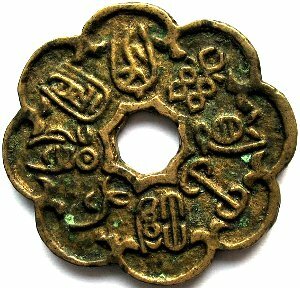 Curiously enough, Korea used about 50 of the characters from the “Thousand Character Classic” on the sang pyong tong bo (常平通宝) coins which were cast during the years 1633-1891. The four characters explained on this charm, however, were not among those used on the coins. But, this raises several questions. Why were the characters for “you”, “easy (exchange)”, “protect” and “red” chosen from among the thousands of Chinese characters that had not appeared on the coins? Why were the inscriptions written in an invented “seal script” instead of an authentic “seal script”? And, because of the added difficulty, why use any “seal script” instead of “regular script” to teach simple Chinese characters to a child? Under the seemingly innocent pretext of teaching Chinese to children, it may be that this little charm has a hidden agenda. I’m trying to send you a picture, but I can’t find a way through this site. How can I show it to you? It’s a piece of jade. It’s rather large. I know nothing about it. I found it in a china shop years ago. I was drawn to it. Now I want to clean it, but don’t know if I should. I don’t know what it is. My email address can be found at the bottom of this page. I sent you two separate e-mails. One with pictures and one with a quick note. Did you get them? The obverse side of your jade charm has the inscription zhen zhai zhi bao (镇宅之宝) which translates as “Treasure to rid a dwelling of evil spirits”. In the center is a taiji (yin yang) symbol in the form of two fish. One of the fish is shown with scales. The reverse side displays the eight trigrams and the taiji in the middle. As you have noticed, the order of the eight trigrams is unusual and different from normal. Surrounding the taiji symbol in the middle are the names of the “eight trigrams” (bagua) written in Chinese according to the King Wen “Later Heaven” arrangement. Please be aware, however, that the Chinese names do not match the corresponding trigram symbols on your charm. I know of no good reason for this mismatch. I do not have experience with jade and am unable to authenticate or date such pieces. I also do not know their value or how to clean them. I will keep you informed if I find out anything more. I will watch to see if any of your followers comment.